If you're looking for simple ideas for family meals that your baby can share, our second book, The Baby-led Weaning Cookbook (UK edition, hardback), published in November 2010, is for you. It's a compilation of recipes sent to us by BLW parents, with just enough basic information about BLW to enable anyone who hasn't read the first book to give it a go. In the USA the Cookbook is available in both hardback and paperback. Baby-led Breastfeeding: How to get breastfeeding to work with your baby's help is an up-to-date 'how to' book that will help you to get breastfeeding to work for you. If you prefer diapers to nappies, go for the US edition. Baby-led Parenting: The easy way to nurture, understand and connect with your baby is full of tips and suggestions that will help you to get to know your baby and interpret what he needs, helping you adjust easily to being a parent. Order our books direct from Amazon by clicking on the links below - the first four buttons are for the UK editions and the others are the American ones. 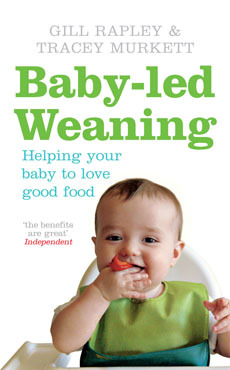 You can order the Polish edition of Baby-led Weaning: Helping Your Baby to Love Good Food from within the UK here. Gill Rapley is a participant in the Amazon EU Associates Programme, an affiliate advertising programme designed to provide a means for sites to earn advertising fees by advertising and linking to Amazon.co.uk, and in the Amazon Services LLC Associates Program, an affiliate advertising program designed to provide a means for sites to earn advertising fees by advertising and linking to amazon.com. Amazon and the Amazon logo are trademarks of Amazon.com, Inc. or its affiliates. As an Amazon Associate I earn from qualifying purchases.